Spring in Melbourne is the perfect time to plant your beans. Beans are the perfect veggie for your home garden plot. They are packed with protein, vitamins, minerals, fibre and complex carbohydrates. There are hundreds of varieties available and the one thing they all have in common is the ability to improve the health of your soil. 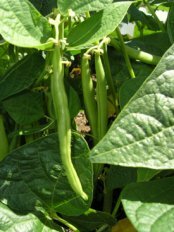 Bush beans and dwarf varieties are self supporting and like their name suggests climbing beans need something to climb on such as trellis or a tee pee. Make sure you install your support frames before sowing your bean seeds. When you sow, water the seeds in well and don’t water again until after the seedlings appear. Beans start to flower in 6 – 8 weeks after planting followed by the yummy edible green pods. Bean pods grow very quickly so you will need to harvest them regularly. Pick them before they become too large and lumpy to make sure you eat them when they are at their sweetest and crunchiest. We love eating our fresh beans straight off the plant. Don’t forget to plant some basil with your tomatoes. The scent of basil is said to confuse many tomato pests. 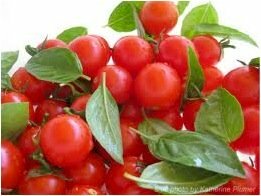 Tomato and basil taste great together and if grown in the same bed can be harvested at the same time.